Hello and Welcome to the December Crafty Wednesday Challenge here on my blog. It's time for a new theme and hope many of you will join in this time. There were some gorgeous entries last month, be sure to scroll down to see if you are the winner or one of the Top Picks! So pretty much anything with Snow, and I can't wait to see what you come up with this time. This was a really quick card to make. I simply heat embossed the snowman and sentiment both from the Penny Black Set Let It Snow using Versafine Onyx ink and Clear Embossing Powder. Added a little bit of color with a Zig Clean Color marker (light blue, available in this set of 4) and a Wink of Stella clear glitter brush was used for some sparkles on the snowman (this is really hard to see). I stamped 3 snowflakes which is part of the set and added sticky back rhinestones to each of the snowflake's centers. Designer paper is from my stash, I think it's by Authentique. Silk Ribbon and a bow finish off this card. The prize for the month of December will be a $6.00 Gift Certificate to Mo Manning's Digi Shop, sponsored by me. It's time to announce the winner from last month's challenge. I use random.org for the prize winner who will receive a $6.00 Gift Certificate to the Tiddly Inks shop (sponsored by me). 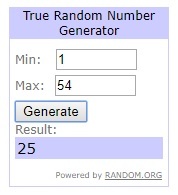 Congratulations, you are the lucky prize winner! Please contact me by the end of the month at ellibelle_blog at yahoo dot com to claim your prize. No. 9 - Carol S.
Congratulations, ladies! Your top pick logo is below, feel free to post it to your own blogs! To be in compliance with GDPR regulations, I am not allowed to post links to the individual blogs, but you can see their gorgeous creations by visiting last month's Linky Tool. To join in this month, please leave a direct link to your blog post using the linky tool below. Remember to leave a link back to this blog in your blog post. And feel free to combine this with any other challenges! So CUTE! LOVING that snowman!!!! Cute card! Love the striped paper and your snowman! Congrats to the winners! Thanks Marilyn! Have a great day too! Great snowman! Thanks for joining in our Glitter and Sparkle challenge at Stamping Sensations. Thanks Viv! Happy I was able to join this month! This is so pretty, beautiful snowman. Adorable card, I love that sweet snowman and the striped paper! Fab card! Cute snowman, love the bold design Thanks for joining us at Sweet stampin' this week. Your snowman is adorable, and I like the striped paper accent! Thanks Jean! Striped paper is my favorite! Love that you did the card in blues and your snowman is adorable. Thanks for sharing with us at Double Trouble and Three Amigos. Please come back for future fun challenges. Thank you, Sue! Will check back with Double Trouble soon! Thanks for stopping by, Maura! Cute little snowman! I like the cool blues. Thank you for joining us at Double Trouble.